Millennials—often characterized by their adept technology skills and low tolerance for delays— will soon be in decision-making positions in the court increasing the need to integrate effective technology in the legal system. 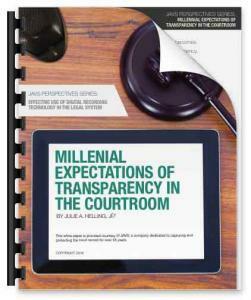 In the white paper, “Millennial Expectations of Transparency in the Courtroom,” Julie Helling explores this idea. In it she writes, “Advances in technology mean that it is easy to capture court proceedings digitally and make them available quickly and at low cost to the public. Given Millennial comfort with technology and low tolerance for delays, this technology is a tool that the court can use to meet expectations and further public education on the legal system.” Download the white paper here for the full story. While transparency has long been considered an important value of the American legal system to promote accountability and public education, the expectations of the Millennial Generation (generally considered those born after 1980 until late 1990s) bring an even greater sense of urgency to the equation. Millennials expect quick, easy, digital access to data and are accustomed to important information being readily available online for free. Today, advances in digital technology mean that most of the highest appellate state courts already put audio or video recordings of their proceedings on the Internet. The trend toward the A/V recording of court hearings—and away from the cost and delay of obtaining written transcripts—will only increase as Millennials move into positions of power and shape the legal system even more directly. Preserving the Record for Tomorrow's Justice System. Is the national court reporter shortage affecting your transcription business? Yes, please contact me regarding the latest AV technology for courtrooms, conference rooms or lecture halls.